Earwig is just one of a varied group of participants – a priest and two Catholic nuns among them – who have come to the retreat for different and often opaque reasons. Olin’s own reasons are more complicated than he at first admits. His grandfather was a Polish Baron from the very area he has now returned to (the first member of his family to do so) who left for America in 1939. Olin hopes to unravel the mystery of his own childhood ties to the nearby village while he is there. In part he wants to understand his father’s suicide, which is linked in his mind to that of Borowski. Even this, though, is frowned upon by others. 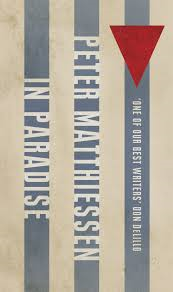 In Paradise is not an easy novel – it seems jagged both in its construction and the effect it has on the mind, posing questions without answering them – but also without suggesting there are no answers. This applies not only to doubts about how we comprehend and react to the Holocaust, but to the novel’s characters. What, for example, are we to make of Olin’s feelings for Catherine? Is Earwig the voice of truth or cynicism? It is a difficult novel not in the sense we would normally use that word in literature – difficult to read, difficult to follow – but difficult in that it unsettles. And that is entirely the point. You are currently browsing the archives for the Peter Matthiessen category.